Typical, so damned typical. There has been resistance to controls and safety measures from tug and barge operators in the pristine waters of Great Bear and other US and Canadian waters. This sets the scenario of disaster. Whether moving tankers, or drilling for oil, it is not a matter of IF there will be an accident, but WHEN. So much at risk, and the damage will not be completely remediated. The Exxon Valdez spill occurred in 1989. After 27 years there is still oil rising to the surface. There are things that could be done to reduce risks, these various options are also resisted. Profit is God, and the beauty and intricate web of life the gods created is simply an expendable cost item. 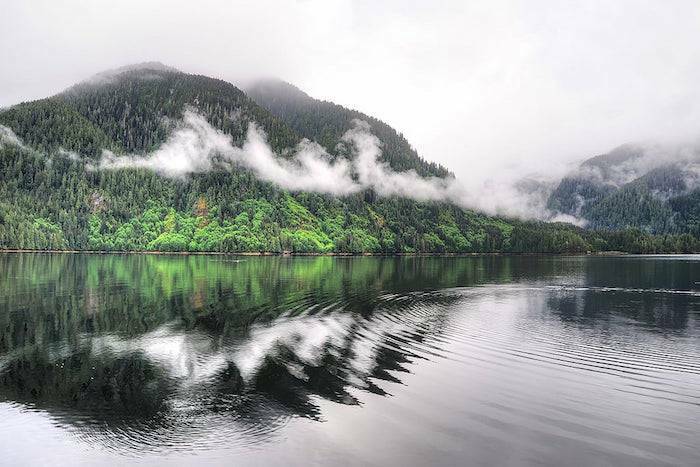 Photo: The pristine waters of the Great Bear Rainforest in B.C. Now drop an oil spill into this picture. Credit: Kathryn Burrington. utrage is the only word for what people are feeling after a tug and fuel barge, owned by Texas-based Kirby Offshore Marine, crashed on rocks in the heart of B.C.’s Great Bear Rainforest on October 13. It’s been leaking 200,000 litres (59, 024 gallons) of diesel fuel into the sensitive marine ecosystem ever since. The 30-metre Nathan E. Stewart tug was pushing the empty fuel barge DBL 55 south from Alaska where it had dropped off its petroleum cargo of 52,000 barrels of oil. It was operating without a local pilot in the complicated waters of the spectacular Inside Passage. Only three weeks ago, the Duke and Duchess of Cambridge, Prince William and Kate Middleton, had visited the Great Bear Rainforest near Bella Bella, B.C. and were hosted there by the Heiltsuk First Nation, who have extensive clam, herring, salmon and other fisheries in the region now threatened by the sunken tug’s oil slick. The Great Bear Rainforest is the largest remaining tract of intact temperate rainforest in the world. It is home to Sandhill cranes, grizzly bears, grey wolves, humpback and orca whales, giant conifers, every species of wild salmon, and many other wild species. The crash and its environmental impacts have drawn widespread criticism from First Nations and others, who are questioning the inadequate spill response measures and the diminished Canadian Coast Guard presence on the entire B.C. coast. Others – especially Ingmar Lee – are questioning “the pilotage exemption” and the very existence of this little-known tug and barge “petroleum conduit” to Alaska. Such a waiver – an exemption from the requirements of the Canada Shipping Act – had been given to the Nathan E. Stewart, which made weekly trips through the Inside Passage to deliver oil to Alaska. This tug/barge unit was just one of many such units that run up and down B.C.’s Inside Passage to deliver petroleum products to Alaska. According to Bloomberg News, Texas-based Kirby Offshore Marine as of 2010 is operating 57 tank barges and 64 tugboats similar to the Nathan E. Stewart, which now sits at the bottom of Seaforth Channel near Bella Bella. Ingmar Lee has been trying for a long time to get Captain Kevin Obermeyer to stop handing out waivers to all the U.S. tug/barge traffic using the Inside Passage for oil delivery. The wreck of the Nathan E. Stewart may change that. Yuliya Talmazan, “Tug boat and fuel barge run around near Bella Bella: crew rescued, leak reported,” Global News, October 14, 2016. Bethany Lindsay, “Feds revoke petroleum barge’s rights to ply B.C. coast without Canadian pilot after grounding,” PostMedia News, October 13, 2016. Megan Thomas, “Clam beds at risk after sinking tug spills fuel near Bella Bella, says local First Nation,” CBC News, October 13, 2016.